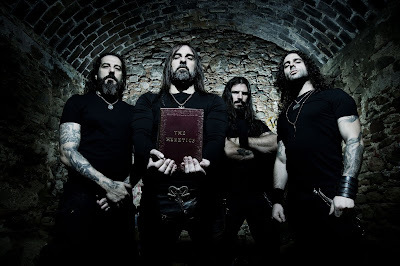 Home / breaking-news / rotting christ / Rotting Christ premieres new single "The Raven"
Rotting Christ premieres new single "The Raven"
Greek metal trailblazers Rotting Christ have unveiled a video for the new song "The Raven,” which is the third single from their highly-anticipated forthcoming release, "The Heretics". "The Heretics" is out on February 15 via Season of Mist. Pre-orders for "The Heretics" on limited deluxe CD Box, jewel case CD, limited LP and more are available here. Frontman Sakis Tolis comments on the new song, "We proudly present to you ‘The Raven;’ the third song from our upcoming new album "The Heretics". It is the epilogue of the album, and one of our most atmospheric and melodic creations. It's a tribute to one of America's most (in)famous writers - Edgar Allan Poe - and more specifically to his influential poem of the same name. Enjoy 'The Raven' and see you soon on our heretical path!"